"Our new favourite Soho local"
"A local's pub in the heart of the city" The Lyric isn't lying about that, this compact Victorian boozer in the heart of Soho is just about the best pub in central London that we'd never been to. And why hadn't we been? Because we clearly thought it was locals only. But alas, for the sake of Soho drinkers, this appealing pub is open to all and on the Friday night we visit, the place is rocking to a crackling open fire and a surprisingly excellent range of beers on the taps. When you're tired of the bars and restaurants - mostly restaurants - that have knocked out Soho's charming old institutions and sent them packing, there aren't many classics to visit in this increasingly homogenised area. But, the next time you need one; you can add The Lyric to your list along with the likes of the Blue Posts, The French House and Trisha's. Behind the dark green sign, hanging plants and etched windows, the traditional look continues with the usual Victorian trappings that keep the pub feeling like little has ever changed here. However, that's not quite true; in one giant leap for drinkers' enjoyment, the Carling and Fosters have been banished, replaced by an excellent range of draught and bottled beers at The Lyric, accommodating those with a taste for the unknown. We drink the Kernel Pale Ale on draught before switching to the fridge and testing out bottles from Magic Rock Brewing. Expect to find the pub crowded towards the end of the week and don't even think about getting a table (numbers are slim) unless you can bunk off work early and hit the place before 5pm. 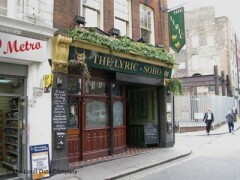 But crowded or not, tables or none, the beer, atmosphere and overriding charm make The Lyric our new Soho favourite. Had the cheap lunch offer...pork belly with mash and cabbage for a fiver...it was well presented and absolutely lovely. Nice pub too. Will go again when next in London! !